Front-end overhaul at 132,000 miles. I use Toyota factory pads. 3" longer in the rear to accommodate the extra rear articulation. The SS lines won't bulge under pressure, therefore offering firmer braking. 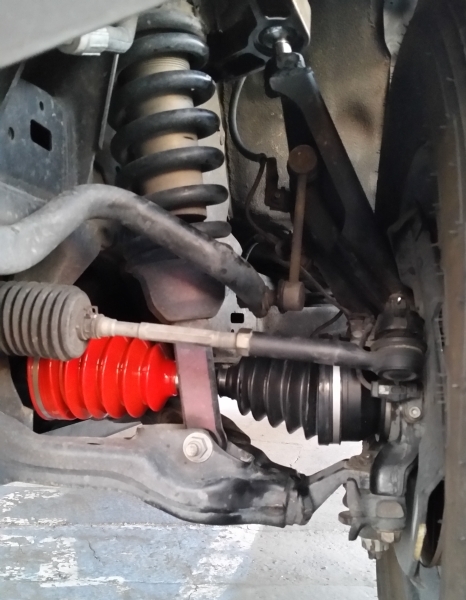 In order to drive through water deeper than the rear axle it is recommended to extend the rear diff breather. This keeps the diff from sucking in water through the stock breather right on top of the axle when it is cooled rapidly. With the breather up in the gas cap area you are safe to ford water up to the top of the passenger front fender - where the air intake is. SS brake lines don't expand under the hydraulic pressures from the braking system. The rear lines are 3" longer than stock to accommodate the suspension lift. A friend welded up some steel along the sides of the stock brace to beef it up. These have been known to break off-road. Makes oil changes much easier, especially once I get my BudBuilt skid plates bolted back up.